When I was in New York a little while ago, Kenneth Cole was launching a new book called Awearness. I bought the book out of curiosity and on a bit of a whim. Now, I’m so glad that I did. Awearness is an endless source of inspiration for me. Kenneth Cole, the book’s author and editor, is a celebrated fashion designer in the United States (he’s not so well-known in Europe though). He is also a social entrepreneur, who has been working to bring awareness to the issue of HIV/AIDS for over 20 years. Awearness is collection of essays written by world changers. 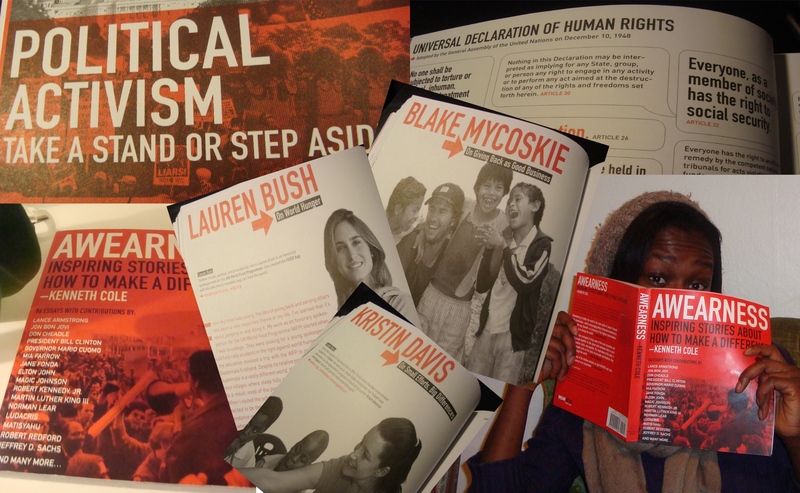 The book was written as a wake-up call to our generation and to show each person’s unique ability to build a better world. In this book you’ll get inspiration from social entrepreneurs, non-profits, philanthropists and businessmen, these are all people who are doing their part to change the world. 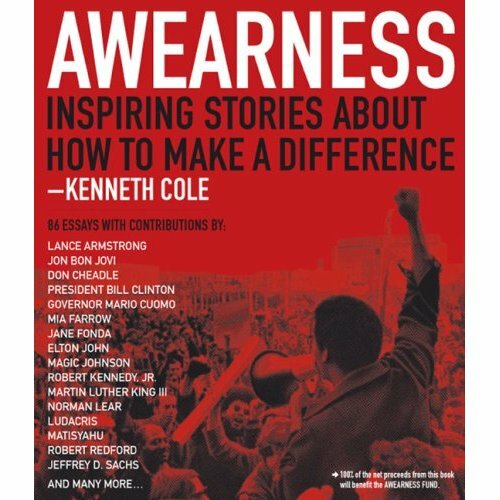 Awearness features everyone from Mayor Michael Bloomberg to Alicia Silverstone, from Lauren Bush to Don Cheadle, from Robert Kennedy to Lance Armstrong and from Jeffrey Sachs to President Bill Clinton. The book is also great at making concepts and policies, such as the Universal Declaration of Human Rights, Millennium Development Goals and the milestones in the fight against HIV/AIDs, easy to understand and accessible to everyone. For each topic the book covers – civil liberties, health, homelessness + poverty, well-being, etc – it will list a number of charities and organisations, so you can get personally involved in making a difference. The book is eye-opening and challenging. It shows you what is possible. I loved it when Mr. Cole wrote this, ‘It is important to remember that it is most ordinary resources that have initiated and/or inspired some of the most extraordinary change.’ That gives us all a bit of hope that we might do something extraordinary. Another quote I like is this one: ‘Life is not a dress rehearsal and you can change your outfit, you can outfit change, or both’. Gotta love that! To buy the book click here. Check out the Awearness blog as well. P.S. Sorry for being M.I.A with the posting, I got sick last week and that threw everything out of whack. Hopefully, I’ll get into a good pattern soon. Thank you for stopping by even when I’m new post-less… I really appreciate it. This entry was posted in Bookshelf, Charity Fair, People and tagged Activism, Alicia Silverstone, Bloomberg, Book, Bookshelf, Charity, Civil Liberties, Fashion, Health, HIV/AIDS, Jeffrey Sachs, Kenneth Cole, Lauren Bush, Millennium Development Goals, Philanthropy, Universal Declaration of Human Rights. Bookmark the permalink.